Nissan Pilest, MD performed a video demonstration of a post-CoolSculpting® patient treatment with the Zimmer Z Wave. 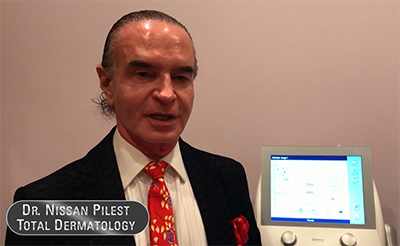 Dr. Pilest has been so impressed by Z Wave that he integrates it for enhanced results after each CoolSculpting treatment. His practice, Total Dermatology, discontinued manual massage, in favor of the more precise and effective Z Wave treatment following the fat reduction procedure. The Total Dermatology website lists Z Wave among the devices used for non-invasive body contouring and tightening. Regarding post-CoolSculpting treatment, the website states, “Thanks to the Z Wave radial shockwave unit, it is also possible to significantly improve skin firmness, skin elasticity and collagen regeneration. Fat reduction, for example, after fat freezing or injection lipolysis is also enhanced by using the Z Wave.” More details and images are provided there about CoolSculpting enhancement with Z Wave. Dr. Nissan Pilest shared this video and his comments without compensation. Scroll below to view Dr. Pilest’s post-CoolSculpting treatment with Z Wave. Nissan Pilest, M.D. is board certified by the American Board of Dermatology. Now practicing aesthetic dermatology, he has treated both medical and cosmetic patients in Orange County, California since 1979. Dr. Pilest and his staff receive ongoing training in order to stay abreast of emerging technologies and techniques. Dr. Pilest states that “a growing practice demands a growing doctor.” Dr. Pilest is an Assistant Clinical Professor at UC Irvine and is a Fellow of the American Society for Laser Medicine and Surgery (ASLMS). He has earned several elite designations for expert dermal injection and for physician training with injectables like Botox, Dysport, Juvéderm, Restylane and Radiesse. He also received Advanced Certification for Thermage and is a Fraxel Re:Store/Fraxel Re:Pair CO2 Laser Training Physician. Total Dermatology is located in Irvine, California. The office offers a range of laser, PRP, injectable and other treatments for anti-aging, acne and acne scars, and feminine rejuvenation. Some of the facial and body transformation procedures available at Total Dermatology include: CoolSculpting followed by Z Wave for enhanced results, Thermage, PelleFirmTM (Radio Frequency), Kybella® injections, Liposonix (High Intensity Focused Ultrasound), CoolMini, Intensif (Microneedling with RF), Botox® injections and Pellevé (RF). The practice website offers a good collection of information, including videos and articles about procedures, and information about the devices and technologies available. To learn more about the practice and the services offered, please visit www.totaldermatology.com. The Zimmer Z Wave transmits powerful sound waves into the tissue. The energy then spreads out radially to enhance the treatment effect (Radial Pulse Therapy). The body responds to these sound waves with increased metabolic activity in the form of lymphatic drainage and increased blood circulation. The end result is an improvement in the appearance of cellulite and improved results when used with other body contouring procedures. For more information about the Z Wave, visit a web overview of the product. You may also contact Zimmer any time by phone or email.